Precision Air Conditioning and Heating units are designed and built to withstand the extreme temperature and high demands of living in the Southwest desert. Compatible with network integrated controls and digital/smartphones. High-efficiency variable speed motor saves energy. “Built Desert Tough” means high efficiency in demanding conditions along with the most comprehensive warranty. LIFETIME compressor warranty, the best warranty in the industry. Other brands only offer a 10 year warranty on the compressor itself. All Precision air conditioners are built desert tough. This means that even the nastiest Arizona weather is no match for Precision. We’re so confident that you’ll enjoy a lifetime of comfort in the desert with our Precision line HVAC equipment, that it’s guaranteed for life*. So, don’t risk the indoor comfort of your home with just any air conditioning system. For long-lasting performance, install a quality Precision brand air conditioning system in your home. Keep your home cool, save energy costs, and enjoy peace of mind with industry-leading warranty protection. Compare the features and benefits of a Precision model central air conditioning system with any other competitor and you will discover why more and more homeowners “Make the Precision Decision”™. This is the best limited warranty offered by the Precision brand of air conditioners. The compressor that comes included with your new ASXC18 air conditioning system is covered by a Lifetime Unit Replacement Limited Warranty. If your new unit’s compressor ever fails, a replacement compressor will be provided to the original buyer of the central air conditioning system. This only applies to those who still live in the same single-family residence where the central air conditioning system was installed. All other parts of the AC unit are covered by a 10-Year Limited Warranty. For more information and a description of all automatic and available warranties, please call today (602) 349-6922. These air conditioning systems offer you a great value and include the latest technology. Our Precision brand systems, when compared to lower SEER units, will provide your family with cool air while maintaining the highest standards in energy efficiency. 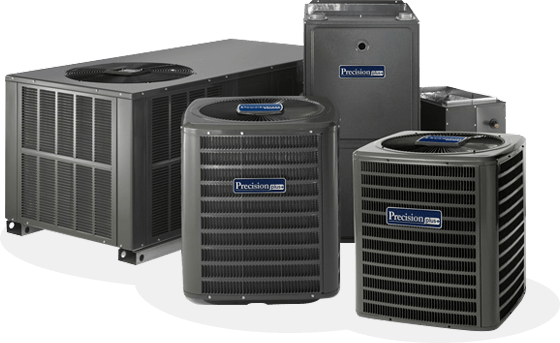 Precision Air and Heating is able to offer our best limited warranties on our branded line of air conditioners. Your new Precision ASXC16 air conditioning system’s compressor is covered by a Lifetime Unit Replacement Limited Warranty. If the compressor breaks in your lifetime, Precision will provide a new one, but only to the original purchaser of the original air conditioning unit. The rest of the unit’s remaining parts are covered under a 10-Year Parts Limited Warranty. To learn more about our Precision line of air conditioning units and the warranties we offer, please call us at (602) 349-6922. We believe that this may be the best warranty in the air conditioning business. The compressor included with your new ASX14 home air conditioning system is protected by a Lifetime Unit Replacement Limited Warranty. If your new condensing unit ever fails, a new condensing unit will be provided to the original purchaser. This warranty is only valid for the original purchaser, if they live in the home they originally purchased it in. All of the air conditioner’s remaining parts are covered by a 10-Year Parts Limited Warranty. To better understand our warranties and what is included, please call today (602) 349-6922. *Warranty varies by equipment model. See a Precision sales associate for details. Need financing for your new unit. Precision Air & Heating offers the most competitive financing in the industry. Shop now to see what may qualify for.